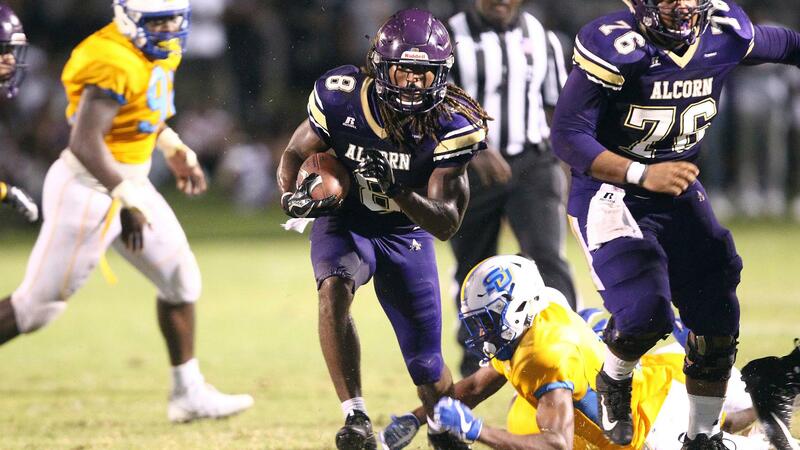 De’Lance Turner has a career day rushing the ball for Alcorn. LORMAN, Miss. – Senior De’Lance Turner posted the second-most rushing yards in school history, 272, as the ground attack for the Alcorn State University football program could not be stopped. The Braves secured a 48-31 victory over Southern in the conference-opener Saturday at Jack Spinks-Marino Casem Stadium. Turner, from McClain, Mississippi, averaged 13.0 yards per carry for the Braves (2-2, 1-0 SWAC) as he was fed the ball 21 times. He rushed for two touchdowns and also caught one. Turner led the Braves to a whopping 402 rushing yards as a team. Junior P.J. Simmons ran for 60 yards and two touchdowns, and senior Lenorris Footman rushed for 70 yards. Footman, the reigning SWAC Offensive Player of the Week winner, threw for two touchdowns. He connected with senior Marquis Warford on a 14-yard route in the third quarter. Defensively, sophomore Solomon Muhammad shined again with a game-high 13 tackles, an interception, and a forced fumble. He returned an interception 71 yards in the first quarter. Junior Leishaun Ealey was also in double-figures with 10 tackles. Alcorn State trailed 24-10 early in the second quarter when they scored 31 unanswered points to take control and leap in front 41-24. The Jaguars (1-3, 0-1 SWAC) got off to a fast start as quarterback Austin Howard threw for 274 yards and two touchdowns. Howard made his first start in two weeks for the Jags. Southern’s Devon Benn rushed for 134 yards and a touchdown.